Place your order online today or call toll free: 1-888-496-6383 9am-9pm Eastern 7 days/week. 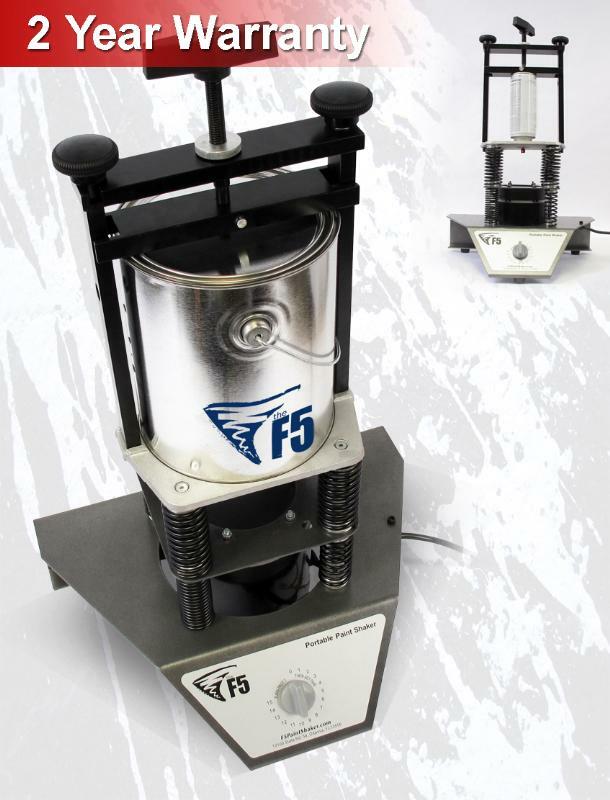 The F5 is an affordable, professional grade paint shaker intended for commercial use. As an all-inclusive kit, you’ll receive the necessary parts and tools to work this shaker from the first day you receive it. Made of steel and then powder coated, each unit is built to last. The powder coating not only produces a more uniform finish, but it works to resist chipping, scratching, and protects the surface from an overall faded appearance. Three Axis Operation. The F5 paint mixer shakes containers three ways: horizontally, vertically, and in a circular fashion. This nearly simultaneous multi-motion works to create an even mixture which no hand mixing could ever match. Portable. Unlike air powered mixers which need to be set in a fixed location, the F5 is a portable, lightweight unit that easily travels. Powered by a 120V AC motor – just plug it into a standard 110 outlet and you're set! Adaptable. With an adjustable clamp, the F5 paint mixer is so versatile. It adapts to the sizes and shapes to accommodate your mixing needs. In fact, it will easily handle up to and including a one gallon container. From the platform to the bottom of the clamp down, the full adjustment there is 8 1/2 inches of clearance. Front Panel Timer. 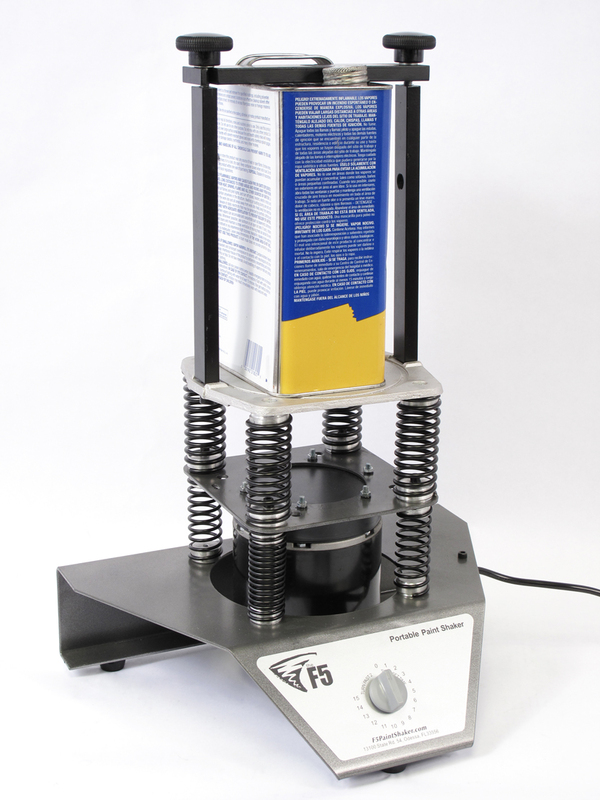 To further enable ease of use, the F5 Paint Shaker comes with a timer for a shorter or longer agitation cycle. With a maximum of 15 minutes, you'll find that it can help mix even dense and low viscosity liquids. Warranty. The F5 comes with a two-year limited warranty from the date of purchase, covering defects in manufacturing and/or craftsmanship. The F5 Paint Shaker is truly versatile. Its adjustable clamp will fit a wide variety of containers, both in size and shape. The clamp adjusts to your specific product and shaking needs from pints, quarts, and even narrow aerosol containers. This adaptability is especially helpful when mixing paints, stains, varnish, industrial coatings, adhesives, inks, and more! See below for this F5's ability to adapt to each unique container… and just imagine what benefits you can enjoy when using the F5 for your business! *Packing & Handling charge is per order - multiple items will not incur multiple handling charges. Offer is for the continental US only. The low maintenance F5 machine gives instant results. 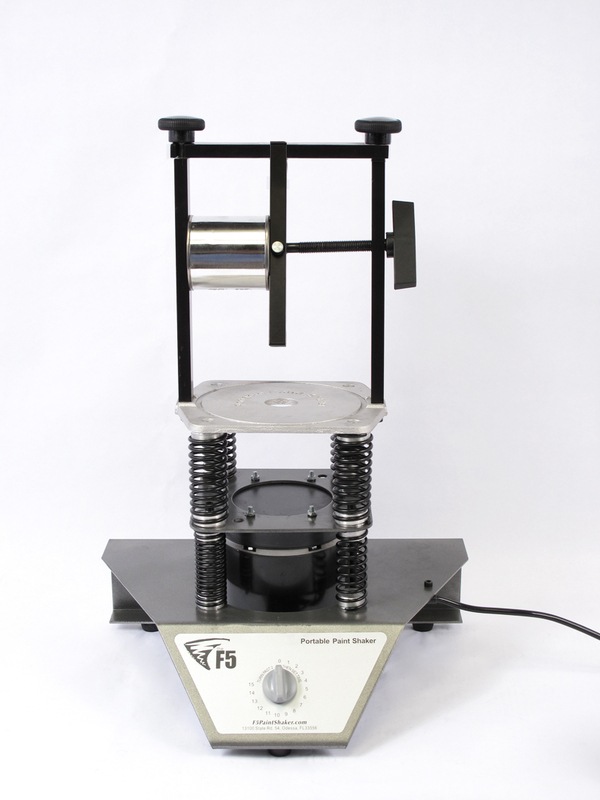 With a wide platform for stability and open design that lets you see the springs in motion: you’ll get fast, reliable mixing that disperses pigments combines liquids, and revives settled product. It will mix aerosol containers, pints, quarts, and even gallon containers. The F5 professional paint mixer is easy to clean and operate, and with the added benefit of a relatively small footprint, you can make the most out of your workspace! The F5 is truly a high-quality product that brings value to many small businesses. The F5 is a dynamic unit which works to shake containers in three ways: horizontal, vertical, and orbital. This simultaneous quick movement helps to mix liquids better than doing it by hand because it works to disperse even the tiniest of color pigments. You can actually see the difference… after a thorough shake, sediment waste left on the bottom of your container is no longer evident. 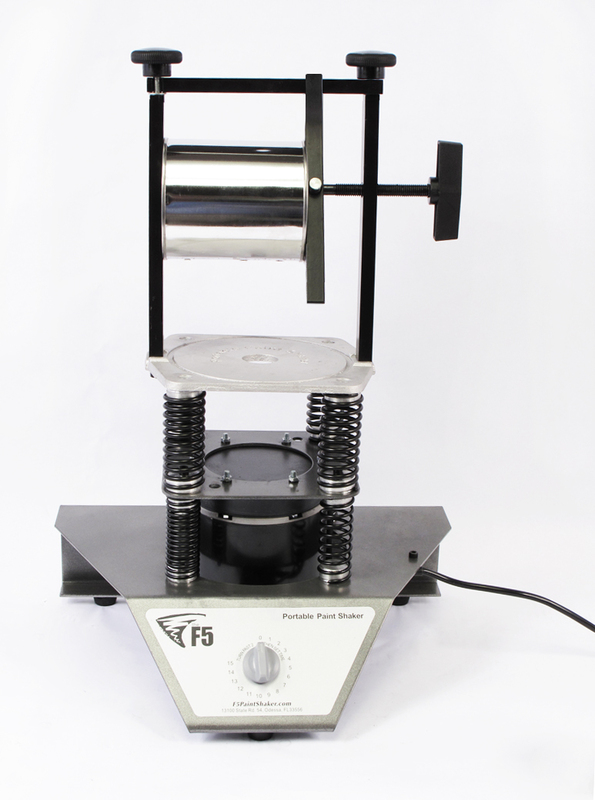 View the F5 Paint Shaker in action - check out this informative F5 in-use video! Browse the instruction manual. The F5 paint shaker, as the most popular paint shaker on the market, was recently selected by ABC's Modern Family to be used in Season 2, Episode 20. 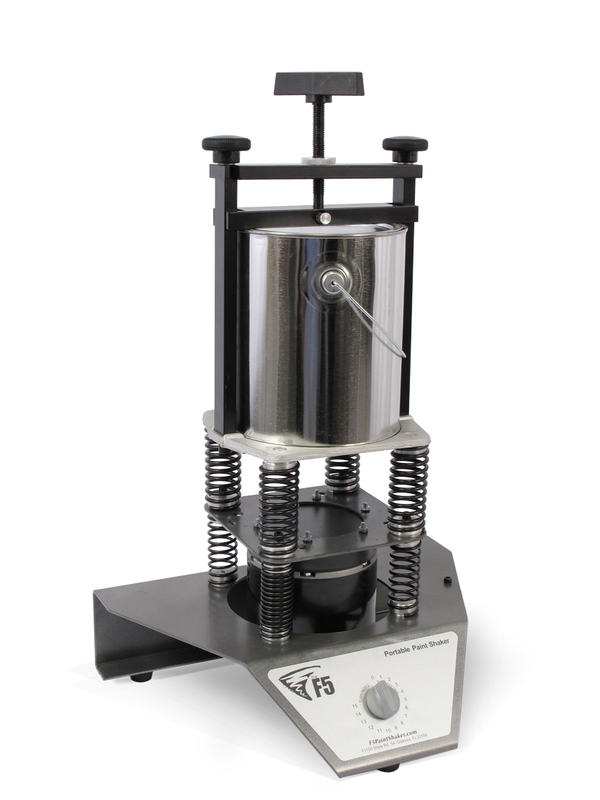 Unlike other paint shakers on the market that deal with belts or pulleys (which can break and be costly to replace), the F5 functions simply have a motor that turns an offset counterweight. Plus, there are no gears, so it makes the need for lubrication obsolete. The F5 is truly a workhorse able to withstand a high volume of usage. Best of all, its lightweight portability enables either counter or floor operation. 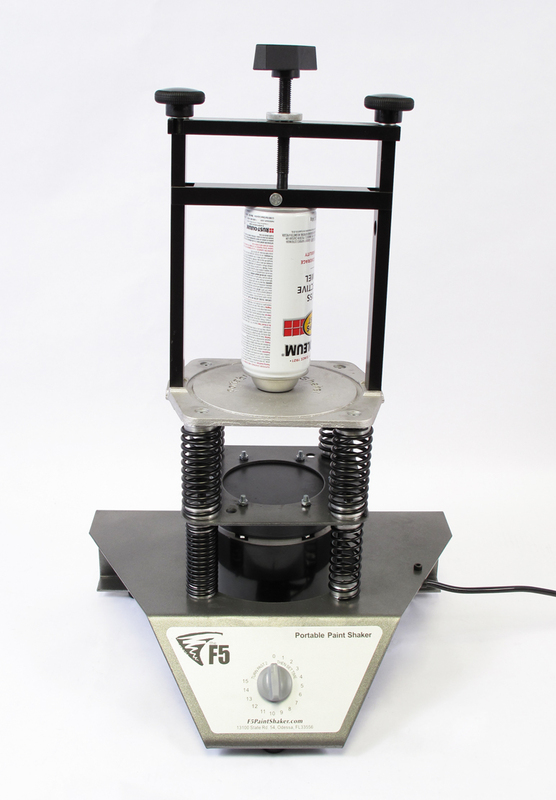 The F5 Paint Shaker was developed out of a need to provide a high-quality commercial level product for small businesses and professionals on a budget. With many paint shakers costing hundreds of dollars and others reaching upwards of a thousand dollars, the F5 Paint Shaker breaks the mold to bring consumers a quality product that fits their budgetary needs. Plus, each unit is backed by a two-year* limited warranty and includes free U.S. based technical support. Ushake.com is an authorized reseller of the F5 Paint Shaker !